All are welcome to Hebocon, the robotics competition for the technically ungifted. The event is organized at Malmö University by the Institute of Interactive Objects and IOTAP. WHEN: Friday April 20 from 18:00 – 21:00. Robot show at 18:00, competition starts at 19:00. Participants can attend a pre-Hebocon workshop on Wednesday April 18. Drop in at the Orkanen Design Lab, Room B129, between 10:00-18:00. More information about about the workshop can be found at the Facebook event page. 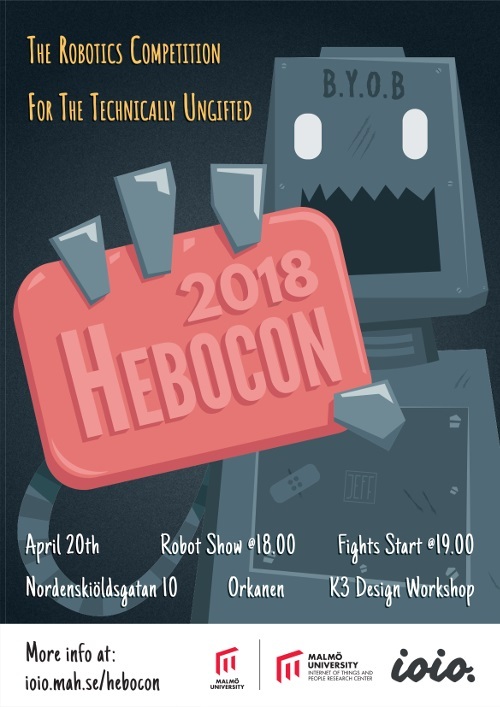 Hebocon is a robot sumo-wrestling competition. All those without technical capabilities are invited to make robots and compete with them in odd battles. Come and display your skills and imagination. This is an opportunity to get to know people with an interest in prototyping and design. For more information, contact Johannes Nilsson. Det här inlägget postades i Medarbetare av DanielHarju. Bokmärk permalänken.